Here at Axcess IT, were always looking to innovate and make use of the very latest technology. 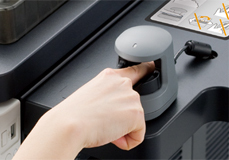 Thats why we have added an exciting new security feature to our system a fingerprint and vein-reader. The system will provide heightened security for all protected systems, ensuring that only the right staff members can excess certain areas and functions. In the past, we’ve used simple fingerprint readers in order to ensure that staff were not accessing parts of the system that were off-limits. But we found that our users were facing problems with this solution. Working in a laundry means hands can get dusty and dirty occasionally, and this was preventing staff members from being able to log in at certain points. Vain-mapping is far more accurate than simple fingerprint reading, which solves the problem of staff members being unable to login because of dirt and dust on their fingertips. First of all, biometric systems are essential in this day and age. Conventional passwords simply aren’t secure enough anyone can look over an employee’s shoulder and learn their password if it’s not robust and complex enough. That’s why we introduced biometric systems in the first place to reduce the risk of staff members taking advantage and learning each other’s passwords. The new vein-scanning development helps take that security one step further. There’s no chance that a staff member could use another employee’s account, which can help with security issues as well as customer service. For example, if a customer has put in a complaint about a certain order or treatment, the manager will be able to pinpoint exactly who was logged in at that time, and who completed the process. This can also be printed at the bottom of the customer’s ticket or receipt, so there can be no arguments or disagreements about who served the complainant. This creates a more efficient in-house service, where staff members are held to account if their work is not up to scratch. Under the past systems, staff members may have been able to get away with poor performance or customer service, but this advanced new module ensures that they’ll be held responsible and must provide the highest standards of service at all times. Zakariya Ahmed, Director of Sales at Axcess IT, says, System security is essential for many of our clients, and were very pleased to have launched this exciting new upgrade for our biometric scanning module. At Axcess IT, were always looking for new ways in which we can improve and move forwards, and this technologically advanced solution is just one of the updates weve been working on in recent months. Some of our clients are already using their new vein-reading software, and it’s going down well at their locations across the country!